What is a Gratitude Log? A gratitude log is a place to write down one (or many) things you are grateful for each day. Do you ever feel like things aren't going your way? That everyone or everything is against you? That you just can't get a break? Let's change all that in just minutes a day! Did you know that your entire outlook can change by just keeping a gratitude log. Gratitude doesn't have to be big..."I'm grateful for world peace." That would be awesome, yes, but it isn't really personal to you. Go with things that mean something to you and affect your life such as, "Yay! I got to sleep in this weekend. " or "I'm grateful for the iris's blooming in my garden." or "I'm grateful the doctor gave me a good bill of health." Benefits of Keeping a Gratitude Log? Don't just take my word for keeping a gratitude log, the proof is backed by science! Psychology Today's article 7 Scientifically Proven Benefits of Gratitude says that when you stop focusing on self-pity and change your focus to gratitude, your life will transform. Read the Psychology Today for more detailed explanations of each. 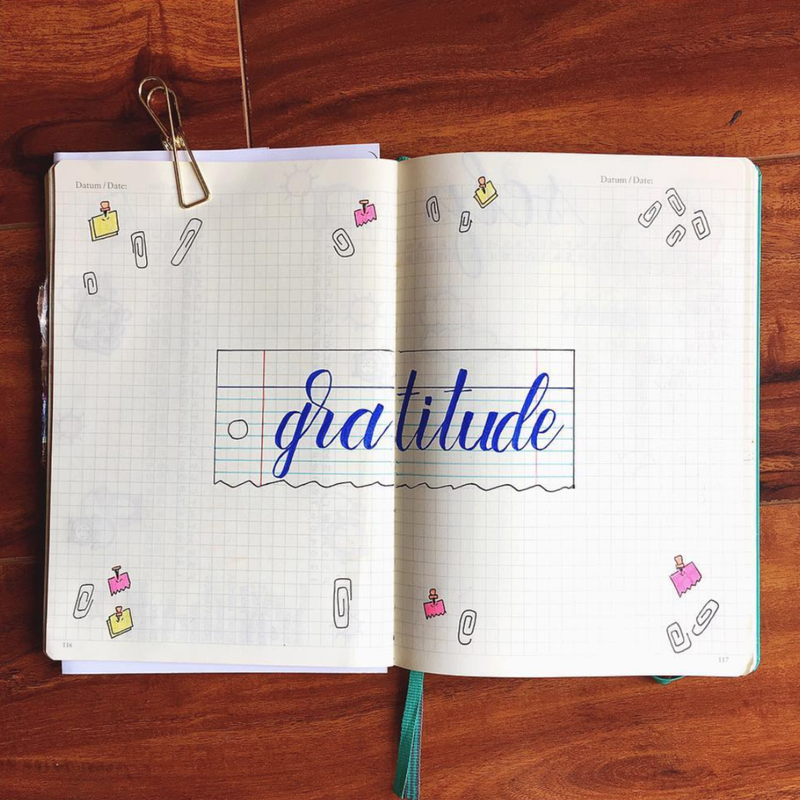 Designate a page or a section in your bullet journal to gratitude. All of the examples below show an entire page or spread dedicated to a month of gratitude. The benefit is that you'll be able to go back and look at your gratitude log as a whole. I've also seen gratitude logged on weekly and even daily pages. Try them all and see what works best for you. There are no rules, just be sure to make it a habit you do daily. 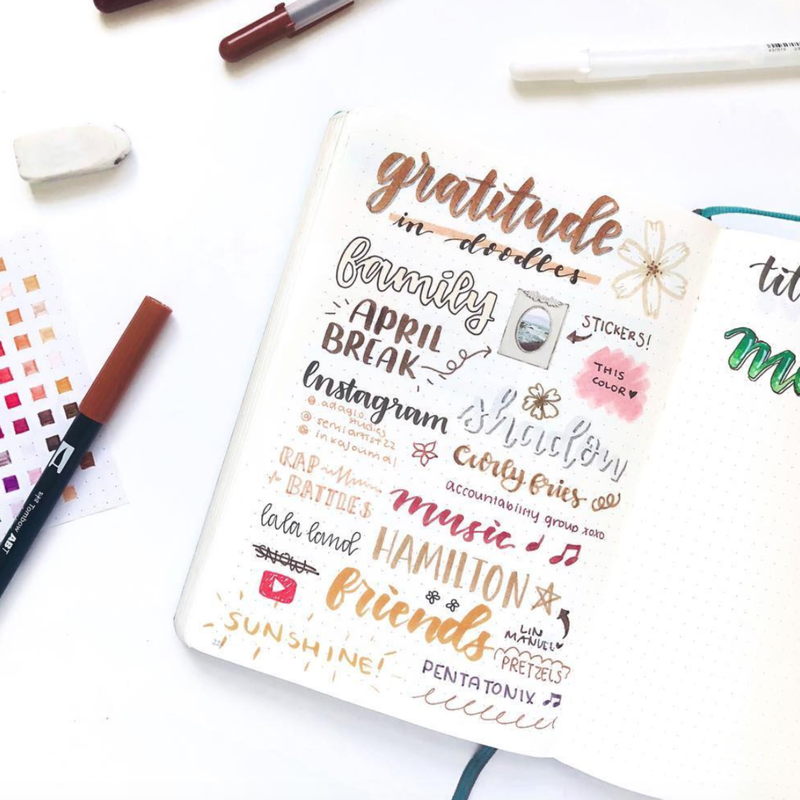 Nosleepplanning made a gratitude spread with a simple layout decorated with note inspired icons and doodles. Cookiedesigncards created a Gratitude Jar! The days of the month start at the bottom and get colored in each day so that the jar is filled by the end of the month, genius! Nosleepplanning made a beautiful spread with a sunflower drawing and an inspirational quote. "The art of being happy lies in the power of extracting happiness from common things." Then the other page is left blank for recording daily gratitude. Sketches.sunny keeps a fun gratitude page by adding her own touches to each log. 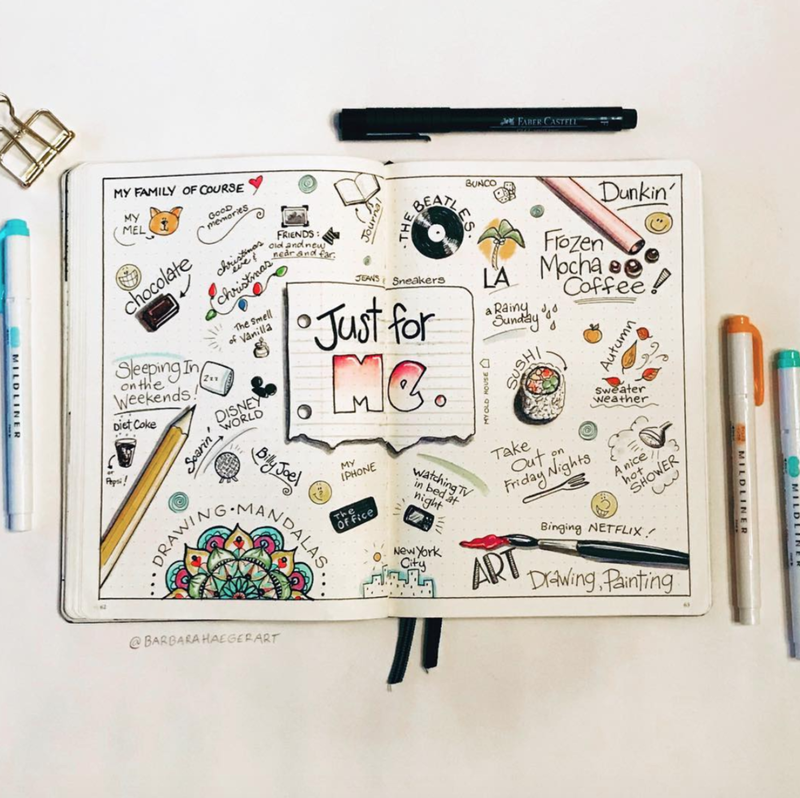 By using doodles, various hand writing/fonts, and a bit of humor, she created a very personal page that is relevant to the things she truly loves and appreciates. It's also a very nice page to reference. Bujolyst shows that a minimalist gratitude log can be just as effective and lovely. By making honeycombs for everyday of the month, there's a space to record gratitude while keeping things need and organized. 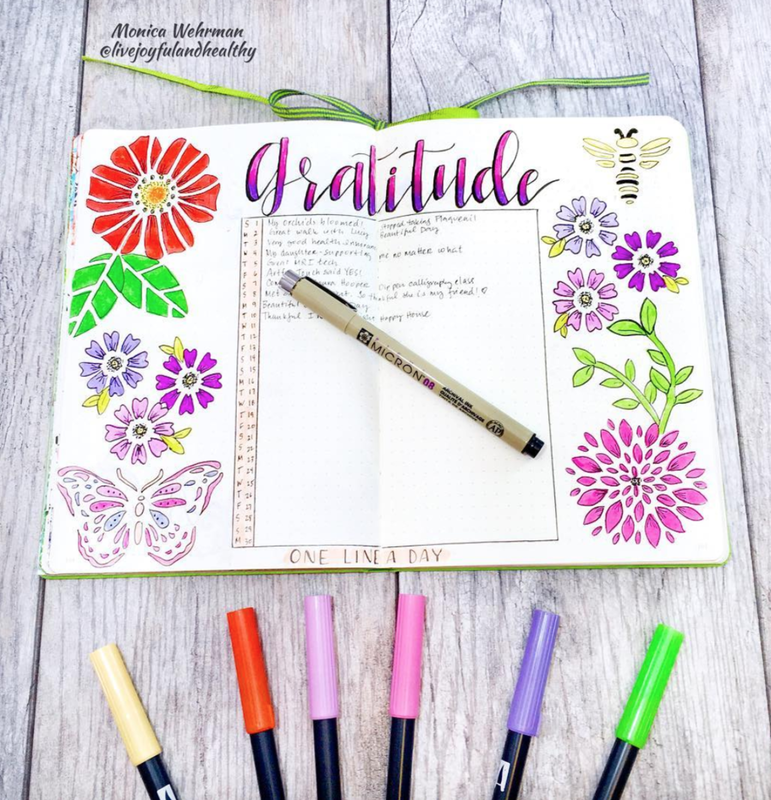 Livejoyfulandhealthy created a vibrant and colorful gratitude log. What a great page to look at every day. Daily gratitude log by Sheboeye shows simple lightbulb doodles and a spot to record daily gratitude. 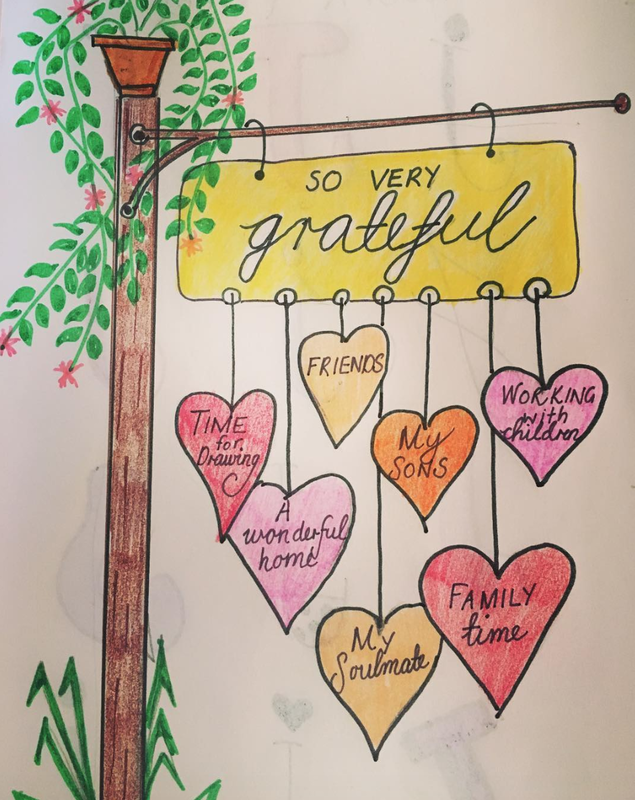 Barbarahaegerart's gratitude page makes the most of her fun doodles! Lookbullet minimalist bullet journal gratitude log uses clean lines and simple dots to divide each entry. Jodie_journals created a hanging sign. The hearts dangling below are the perfect place to record gratitude entries. Try a gratitude log for a month and let me know how it worked for you!